Thu., Dec. 14, 2017, 8:36 a.m.
GENEVA – Syria’s government team at the U.N.-sponsored peace talks in Geneva said on Thursday that there will be no dialogue with the opposition as long as it insists on the removal of President Bashar Assad. The statement ended the eighth round of the U.N.-led talks on a sour note, after days of indirect meetings with no progress. The defiant comments came from the head of the Syrian government delegation, Bashar Ja’afari, just hours after the U.N.’s Syria envoy called Russian President Vladimir Putin to “have the courage” to push his Syrian government allies to accept new elections and a new constitution. In an unusual public appeal directly to a key power broker in the region, Staffan de Mistura told a TV interviewer the Russian leader should “convince the (Syrian) government that there is no time to lose” in efforts to reach peace after nearly seven years of war. Russia has provided crucial military and diplomatic backing to Assad’s forces, though Putin announced a drawdown of his forces in Syria during a surprise visit to the Mideast country on Monday. The Russian president touched down at a Russian military base in Syria in the wake of battlefield successes to laud the troops’ achievements and tell them that a significant number would be going home. “Peace must be won – and for the peace to be won, it’s necessary to have the courage to push the government also to accept that there must be a new constitution and new elections,” the U.N. envoy added in comments late Wednesday to Swiss broadcaster RTS. 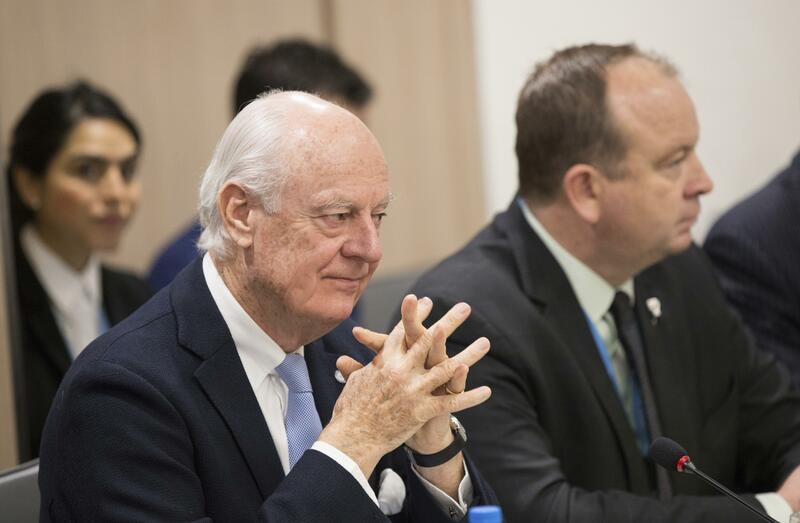 De Mistura, who has mediated the talks since early 2016, signalled frustration at the lack of progress as participants said discussions would wrap up on Thursday. Previous rounds also made little if any progress. The head of Syria’s government team in Geneva, Bashar Ja’afari, extinguished any hopes of a last-minute breakthrough when he emerged later Thursday from a meeting with de Mistura to say his team would not talk to the opposition as long as it insists on Assad’s removal. Ja’afari had not addressed reporters since the government envoys returned to Geneva after a pause earlier this week. In comments to reporters, he slammed the Syrian opposition for its so-called Riyadh communique, issued in Saudi Arabia before the latest round got underway in Geneva. The communique stated that the opposition’s ultimate goal was to see Assad step down at the start of a political process. The Damascus official described the statement as “blackmail of the Geneva process” and said its withdrawal was a precondition for talks. He also told reporters in Geneva that “those who drew up the Riyadh communique are the ones who sabotaged this round” of talks. Ja’afari also blasted de Mistura for his comments on Russia, saying such positions “derail his mandate as a facilitator of the talks, which will have an impact on the Geneva process all together. In the interview, de Mistura said it was “regrettable” that Assad’s delegation had refused to meet face-to-face with the opposition. At the start of the latest round, the delegations at one point were just meters (yards) away from one another in separate rooms. With Russia pushing a separate peace talks track, de Mistura emphasized the importance of a U.N. role in any peace process. Hinting at his repeated concerns about a de facto partition of Syria, the U.N. envoy held up a color-coded map showing the divisions of territorial control in Syria. The war is estimated to have killed at least 400,000 people and driven over 12 million from their homes. Published: Dec. 14, 2017, 8:36 a.m. Tags: Bashar Assad, Geneva, opposition, peace talks, Syria, U.N.